15 min ride from the SNCF station and the station "Rond point du Prado"
Stop station: "Rond-point du Prado "
by north highway A7-A51: Aix, Lyon, Paris, Bruxelles. by coastline highway A55 : Arles, Montpellier, Toulouse, Barcelone. by east highway A50 : Toulon, Nice, Milan, Turin, Gènes. Direct connection between coastline highway A55 and east highway A50 through the Prado Carénage tunnel. Visitor price list : €5 or €6 per day in high/low season. Payable by cash or credit card. Direct connection from the airport to the train station every 15-20 min. Average travel time: 25 min. 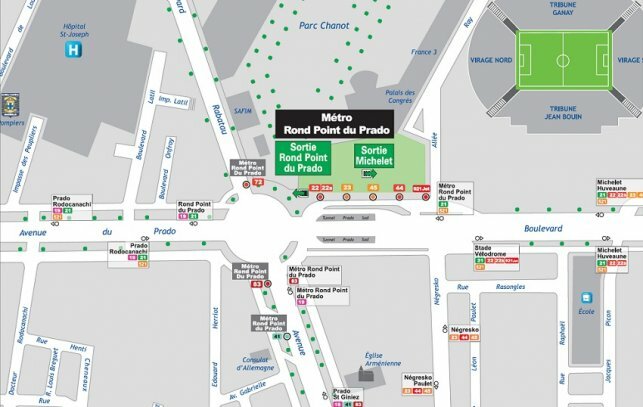 At Marseille Saint Charles, take the metro line 2, "Sainte Marguerite Dromel" direction and get off at "Rond Point du Prado".